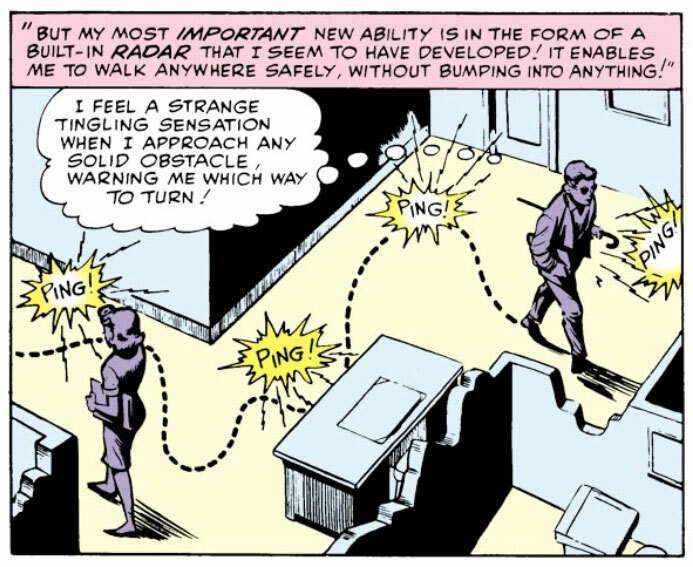 A history of Daredevil's radar sense #1 - From the origin through the early "power upgrade"
As promised – though a little late – here’s the first of many looks at the portrayal of the radar sense. The “prologue” to this little series can be found in this post, so I’ll let the panels themselves do most of the talking here, and just inserting some comments along the way. Part of my motivation for doing this series stems from wanting to know the “best” way to imagine this sense, and that was also why I decided to ask DD fans some questions on the Man Without Fear website a few months ago. Judging from the answers I got, each fan seems to have his or her own interpretation and that seems to go for the writers as well. Another point I wanted to make during that discussion was that the radar sense has not been clearly and unambiguously defined, and that’s a conclusion I stand by. As you’ll see, the radar sense has been based on different things, and had very different properties at various times. Neither one of my own questions, such as “Is the radar sense always ‘on’ or active?”, “Does its effective use require active attention?” or “What is its range?” can be answered definitively. The simple answer to all these questions is that it depends on the writer. That’s not to say that there aren’t some commonalities throughout the series or that some interpretations aren’t more common than others. Here, I’ll just present what it has been, and let each person make up his mind about what it should be. Okay, that was wordier than I had intended, so let’s get started! This is the original explanation of the radar sense from way back in Daredevil #1. I’m not sure what Stan Lee really had in mind for it, but for this and the following issues it seems to be imagined as an entirely tactile sense with few, if any, visual properties. 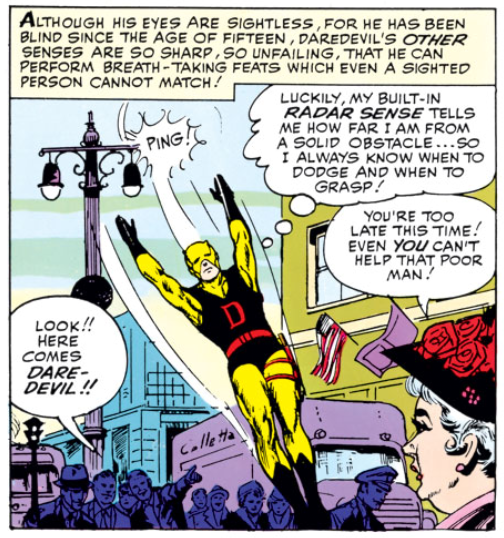 … which is also evident in this later panel of him escorting the always lovely Karen Page to a costume party. A costume party seems like the perfect setting for the Matador, doesn’t it? “Noble-looking”? You’ve got quite an ego there, Murdock! (From Daredevil #6). Here we see our favorite guy in red – uhm, yellow – picking up the contours of a light switch. His powers saw their most substantial upgrade in issue #8 however. If I may guess, I would imagine that this was part of the bigger overhaul of the character that came with the change in costume as well as the fact that his billy club was stuffed full of a ridiculous number of gadgets (to be discussed in full in a later post, of course). Well, ladies and gentlemen, you are beholding a historic panel of comic book history – the very first appearance of the iconic radar rings emanating from DD’s head. As part of the “power upgrade,” he is using them to detect a time bomb under the hood. (From Daredevil #8). Here, in Daredevil #9, we see Matt going to Lichtenbad (it’s not just bad – it’s Lichtenbad!) to meet with the famous eye surgeon Dr. Van Eyck. It would appear as if DD’s radar sense has actually turned into the Hubble telescope, considering he can pick up a walled city thousands of feet below. Here, we also see the radar becoming X-ray vision. While DD retains the ability to “see” through solid objects to this day, it’s been a while since the ability was quite this extreme (or detailed). 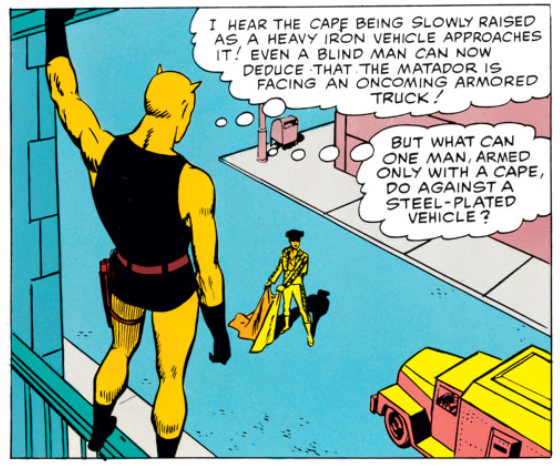 This panel, from Daredevil #11, is included for a couple of reasons. It probably features the third or fourth variation in how the radar rings were drawn (I personally like that the “light” intensity tapers off the way it does here, which makes quite a bit of sense), and it also addresses at least two of my own original questions, namely whether the sense is always active and whether it requires active attention. Well, that’s all the radar goodness I can muster for one post. This series will continue in a week or so, but before then there are plenty of other things to discuss. My next two reviews might have to wait until Monday since I have quite a bit of work to do this weekend, but I’ll definitely see you then! cool stuff. its nice that stan was at least trying to explain how it works. ive never really heard a more recent writer try.